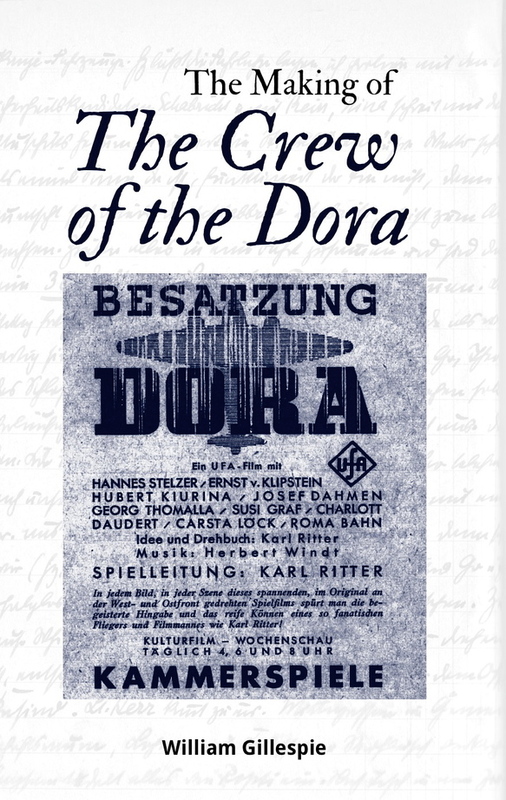 German Films Poster Collection :: "The Making of The Crew of the Dora"
Our research on the film The Crew of the Dora / Besatzung Dora (1943) has resulted not only in a full chapter on the film in our 2nd edition KARL RITTER biography (©2014-2015) but now, as well, a full–length book on the fascinating story of the making of this WWII combat feature film, using the unpublished diaries of director Karl Ritter. Some 50,000 words from his diary from 1942 – 1943 are translated into English and used to tell the story of this remarkable film adventure -- filming in Occupied France, in wartime Berlin, in the Soviet Union 85 miles south of the Siege of Leningrad for a month, in wartime Italy.... the only feature film of the Third Reich ever to be produced inside active war fronts and behind Partisan lines! With 90 photographs/sketches/ maps and 320 pages, it is the most comprehensive study of this film ever written, using primary sources never before quoted until now! The new book tells the story of the only Third Reich feature film -- out of nearly 1100 produced -- which was followed day-by-day as it was conceived, written, scripted, forbidden, revised, re-approved, filmed, edited, banned, re-edited, and kept banned by Goebbels in 1943–1944 through to the end of the war. One of the most fascinating film adventures of the twelve years of the Third Reich! 1. A sketch by Karl Ritter of his study of the cockpit seating arrangement in the Junkers 88–D air reconnaissance aircraft, which was the aircraft of the film's title, "Dora." 2. Ritter in his Luftwaffe Major's uniform outside of Paris at Buc airfield, where part of the film was shot in August 1942. This photo is from June 1942 when he made a four week visit to prepare for the film and gain insights from the airmen and squadron to give more authenticity to the script. At this time the squadron's air reconn flights were photographing London to provide bombing targets for the Luftwaffe. 3. Ritter, his son Gottfried (the film's editor) and film's stars have a day off in Greater Paris on 20 August 1942, where they enjoyed a swim in the pool in Versailles. Ritter standing at the left, with his finger up in the air, signalling the start to a race into the pool. 4. Handsome Dora film star Hannes Stelzer, himself a Luftwaffe pilot in real life, and given leave of absence to star in his fifth Ritter film, signs autographs for his comrades after a film shoot on the Buc airfield, August 1942. He died 2 1/2 years later in Slovakia, when his plane was shot down by a Red Air Force fighter, December 1944. 5. Luftwaffe Fernaufklärer Staffel F./122 men enjoying recreational activities in October 1942 at the Gostkino air base located 85 miles south of Leningrad, when the Siege of Leningrad was underway. Deep inside the Soviet Union, the Dora film crew of 45 men filmed for an entire month. Also shown, as reproduced on page 277 of the book, the Hannes Stelzer film studio shot also used in the cinema owner's promotion guide (Werberatschlag") for the film in 1943. The book is now available to sell within Australia to customers with an Australian shipping address at €29 postpaid (about AUD$48) via our Poster Shop. The price includes the cost of air freighting copies to Australia from the USA, as well as AUD$13.95 domestic postage within Australia. The book weighs over 500 grams and does therefore does not qualify for Letter Rate, and higher postal charges apply. LIMITED AVAILABILITY. Foreign customers –– please check the website of International Historic Films in Chicago, USA or on Amazon Books. Foreign orders will be fulfilled from the USA at the retail price of US$29.95, plus postage charges there. Das Buch is auch auf ebay.de zu finden – es kostet €39 inkl.Porto.